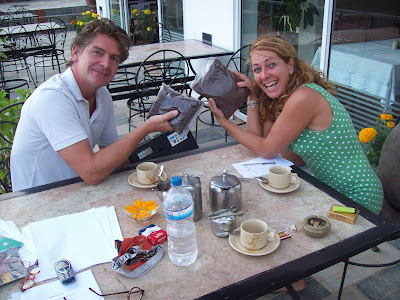 Our highest quality, very rare, unique in its taste Organically Grown Premium Coffee NEPAL BLUE MOUNTAIN seems to become the very best and most precious organic coffee in the world! The demand is A LOT higher than we can produce. 500 grams now we sell for 19,99 Euro plus shipping worldwide with DHL until December 31st, 2016. The farmers get 55%-75% (!) of the retail price. That is "Premium Super Fair Trade" ; )) Isn't it? nepalbluemountain@magic.ms - more than 350 nepali families from the green himalayan hills around BAYALI (= nepali: "flirting with the wind") south of Pokhara (1.100 - 1.600 meter above sea level) and the blue himalayan mountains to the north (Annapurna I - IV) are growing and harvesting it in half shade and processing NEPAL BLUE MOUNTAIN Premium Himalayan Organic Coffee WET with fresh himalayan spring water. Up in the lovely green hills above the tourist hot spot Pokhara 54 year old Nepalese Coffee Farmer Bishow Bandu Pokharel and his 48 year old wife Indira have their organic coffee farm with their three children which all go to school and university down in Pokhara and in Kathmandu. Meanwhile a total of more than 350 farming families here planted more than 55.000 coffee bushes. The quality of our Organically Grown Nepalese Highland Coffee NEPAL BLUE MOUNTAIN is splendid ("Grade A") and already has been exported to Singapore, Hong Kong, Austria, Australia, Denmark, Germany, Switzerland, The Netherlands, Japan the USA, Canada, Russia and more countries. Always in rather small quantities. Coffee-Connesseurs around the world already compare the premium quality and taste of our NEPAL BLUE MOUNTAIN from Bayali with world famous Blue Mountain Coffee from Jamaica! The demand is FOUR TIMES HIGHER than the farmers can produce with slow but sustainable growth. That makes us very happy ;-)). 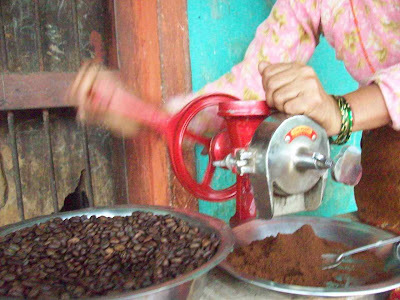 The coffee is just UNIQUE IN THE WORLD and a rare specialty, "dheri ramro chha" as the nepali people use to express themselves. 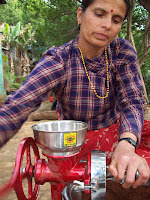 With microcredits and trainig by the swiss NGO HELVETAS Bishow Bandu Pokharel six years ago bought a SIMPLE pulper, a SIMPLE grander and a SIMPLE packing tool - And just two weeks ago a ROASTER JUHUUUUUU!!!. All is HAND PICKED and HAND MADE!! See the fresh pictures of these simple but very effective tools. And get Yourself an awesome treat with our unique NEPAL BLUE MOUNTAIN PREMIUM ORGANIC COFFEE FROM THE HIMALAYAS IN NEPAL. The NEW HARVEST just started in January 2016 and we sell 500 grams for 19,99 Euro until December 31st, 2016 plus shipping worldwide. 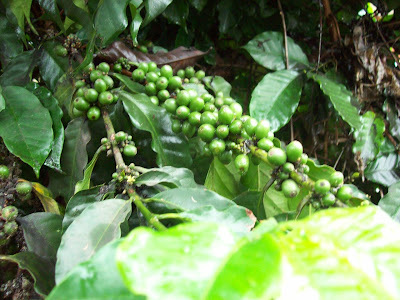 It's ORGANICALLY GROWN PREMIUM HIMALAYAN COFFEE ("GRADE A") growing at an altitude between 1.100 and 1.600 meters above sea level in half shade under orange trees and is being wet processed. That makes the difference and gives it the perfect mild acids. 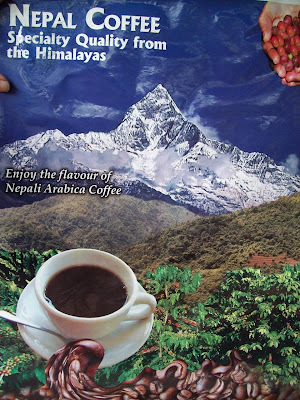 "Unser Kaffee NEPAL BLUE MOUNTAIN ist einfach Der Beste ; )) Optimale Anbaulage im Halbschatten zwischen 1.100 und 1.600 Metern über dem Meer, 300 Sonnentage im Jahr, bestes Quellwasser (wichtig: "wet processing! 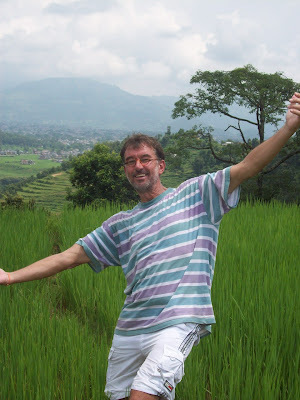 "), zwei Jahre Training durch HELVETAS NEPAL - DANKE! Und immer wieder Handarbeit: Auslese, Auslese, Auslese über sechs warme und trockene schöne, reiche Erntemonate (Januar bis April) für 350 glückliche Farmerfamilien, die neben unserem Edel-Kaffee auch noch Papayas, Orangen, Zitronen, Hanf, Tabak, Oliven, Reis, Hirse, Mais und viele andere Früchte und Gemüse anbauen. Besser geht es nicht. Unser Kaffee im Januar 2016: hoehere Preise fuer reife Kaffekirschen, verbesserte Produktionsbedingungen, wesentich weniger Verluste bei Pulping, Hulling, Roasting usw. Hoere Qualitaet! Super Fair Trade jetzt mit 55 - 75 % (!!) fuer die mehr als 350 - Farmer Familien und Kaffee-PflueckerInnen!